Jalapeño mac and cheese is perfect for warming up on winter weeknights. 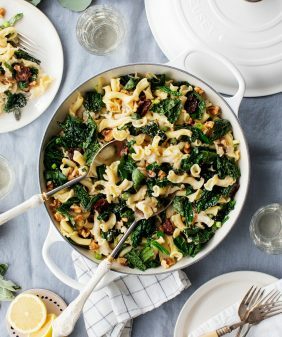 With roasted cauliflower & fresh kale, it's filling, simple & nutritious. Hi everyone, Jack here reporting in from the frozen tundra of Chicago. We flew in for a quick weekend over Jeanine’s birthday (happy birthday!!!) and it is just beyond cold. Austin’s apparently snowing today, but still, not much prepares you for walking outside into 9ºF (-13ºC) weather from a nice, warm airport. This blog is almost always about making meals completely from scratch, but it’s cold times like this that sometimes you just want to pour a box of mac and cheese into a pot and go to town. Well we did that, posted a photo here on Instagram, and people went crazy for it. So this barely qualifies as a recipe, but our Instagram has spoken, and who are we to deny the people what they want? Also, one last time, happy birthday, Jeanine. I LOVE YOU!!! Jalapeño mac & cheese is a great weeknight dinner! 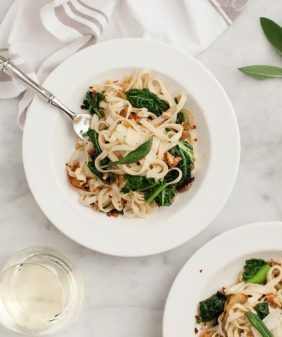 Roasted cauliflower & fresh kale add extra bulk and nutrients to this vegetarian recipe. Prepare your shells and cheese (according to the box), or make your sauce and cook your shells. Mix together, adding enough almond milk to make it creamy. To your pot of mac & cheese (while it's still hot), add chopped jalapeños, kale and stir until the kale wilts. Stir in the roasted cauliflower, and a grating of fontina cheese if you like. Season with salt & pepper. Curl up on the couch under a blanket and enjoy! Anything that features Jalepeno will be a hit in my house! Never too old for box mac and cheese. I love it and it’s exactly what I grab when I don’t feel like cooking. So “recipe” or not, I’m so down with this very grown-up mac and cheese! 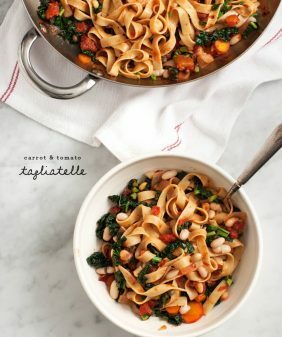 This looks amazing Jeanine – super comforting with a tasty twist! Those Annie’s shells are one of our favorites here, too. I make them sometimes for my son, and almost always wind up taking a little bowl for myself, too. I usually just add peas or broccoli, but this looks SO much better. This recipe sounds delicious. I love Annie’s mac n cheese, but as a single person, the leftovers do not reheat well. Does anyone have any suggestions for reheating the leftovers so that it is not so awfully dry and tasteless? The 2 of us finished the whole thing – maybe try reheating, then mixing in more milk & cheese to make it creamy again? (That or I would cook half at a time since its altogether pretty quick to make). Omg this looks crazy delicious!! So doing it! man you guys know how to dress up a box of Mac and cheese!! Love the fontina addition. Super yummy! Thanks for sharing, the people of IG never lie! let me count the ways i love annies shells. i’ve never even thought to make any additions because they are so good on their own, but, truly, you have opened up a whole new world of possibilities for me. 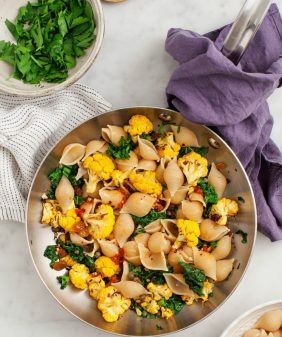 What a great idea for adding veg to mac and cheese…have you ever tried this with any vegetables other than cauliflower or had any ideas about what other veg might work well? Hi Brian – broccoli is good, so is spinach – really any green vegetable! The more I think about it, the more I think that a green zucchini might hold up very well here…thanks! This right here is EXACTLY what I want during this cold & wet Texas weather. Now I just need to figure out how to successfully cook and move around the kitchen with my warm blanket still wrapped around me, without succumbing to buying a Snuggie. Love the additions, sometimes the box is too comforting to pass up. 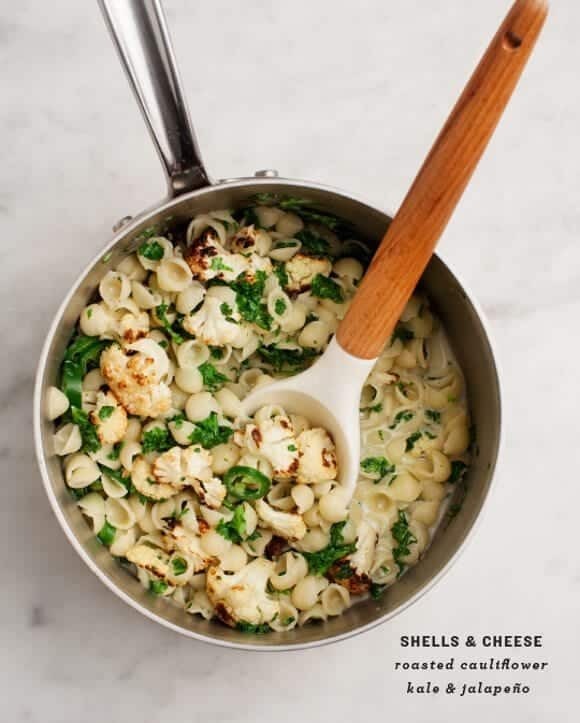 I LOVE Annie’s Shells & White Cheddar Mac & Cheese! I use almond milk too (sometimes Greek yogurt!) and am always making it spicy + adding veggies. 🙂 Great recipe! I discovered your blog via Bloglovin, and I am so glad I did! Amazing recipes! I’m glad too – welcome! I love mac and cheese, and your cauliflower and jalapeño additions sound amaaaazing. 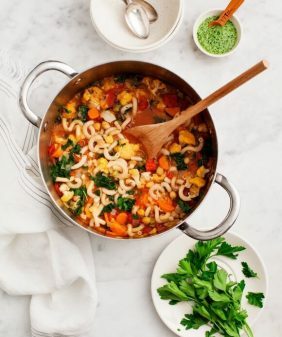 Annie’s is my fave and I always have it on hand, so I totally need to whip this up when I get my next craving. Love – pinned! im always looking for kale recipes! this is great! thank you!! 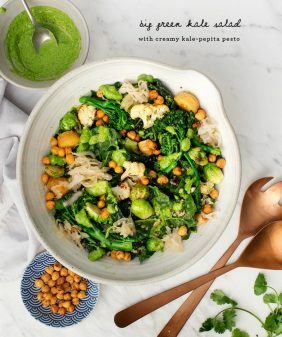 This sounds yummy, but im not a fan of kale. Someone suggested spinach and that sounds good, but at what point would you add the spinach so it doesn’t get overcooked? Hi. how many servings is this recipe? I am making this for myself and 2 men that can eat a lot. I was thinking about making two boxes of Annie’s because 1 box seems small sometimes. What do you think? ps. this is my favorite blog and I tell everyone about it!! Absolutely love your blog! I am new to almond milk – is the almond milk you use here (and in your other recipes) original unsweetened? Hi Caroline – yep, for the most part, especially for using to cook savory foods. I only use it sweetened to drink with and sometimes to bake with. these recipes are fun – loving your site! I haven’t made boxed mac and cheese in years but decided to try this recipe anyway. I was skeptical, but I am glad I tried it. I am also glad I doubled the recipe. 🙂 Will definitely be making it again! Ha, glad you liked the combo!